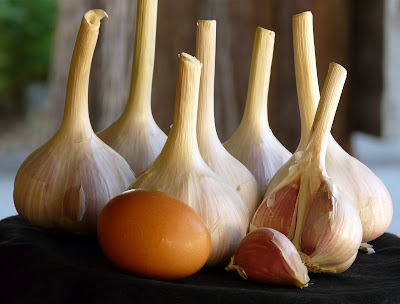 Just to show how big this garlic is - compared to an extra large egg. We have an outstanding farmers market in Duncan. It is open every Saturday pretty much year around. But this time of year is when it is at its best. An amazing array of fresh produce to choose from. Many of the vendors are regulars that I have been buying from for over 8 years. I left home early this morning so that I could go the the market before going to work. I picked up fingerling potatoes, Baby Swiss Chard, broccoli, baby Walla Walla Onions, French Green Beans, golden beets and what I really went for Garlic. Gorgeous big heads of fresh garlic. There are a number of vendors selling garlic and they charge anywhere from from $2.00 to $4.00 a head. One of my favourite varieties is the "Susan Delafield". I picked up 10 of them today. Over the next 4 to 6 weeks I will add to my "stash" and eventually end up with enough garlic to keep me going until the New Year. You've captured them beautifully Ann..I had never heard of this variety! Beautiful photos Ann. I enjoyed reading about your farmers market. The selection of fruits and vegetables now is wonderful. I'll keep an eye out for this garlic variety. It is amazing how different they can be. Beautiful photos. 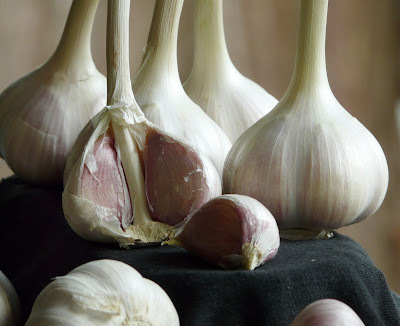 Tell me how you "keep" garlic until the new year, without sprouting. Those are gorgeous photos, Ann. Works of art. 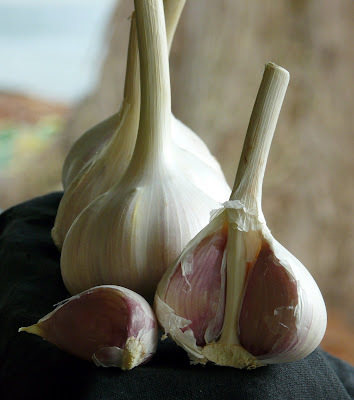 I would love to find big heads of garlic - I will be on the lookout for this variety, as well! Thanks everyone. I wish I could share this garlic with you all. This really is my favourite time of year. I wait with great anticipation for the first garlic of the season. Susan, one of the reasons that garlic sprouts is because of the change in temperatures. 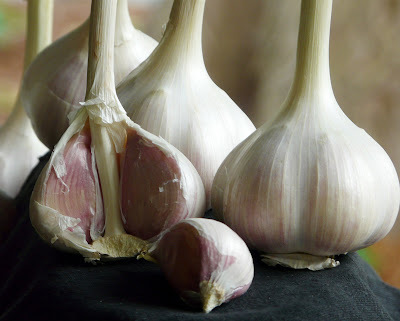 The garlic bought in grocery stores is shipped in refrigerated trucks/ships and then when it gets into the warm stores it starts to sprout. I hang fresh garlic in the kitchen but away from a heat source. Because it is so fresh and because there isn't a wide variation in the temperature it is stored at it doesn't sprout for months. 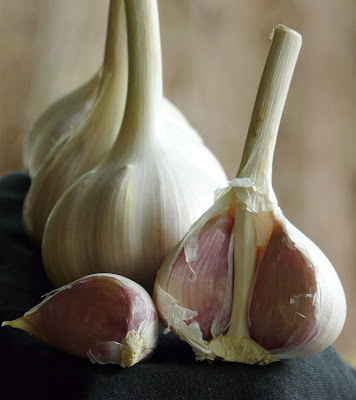 I'm a garlic lover as well and use it in most everything except ice cream LOL but a friend told me he went to the garlic festival in California last year where they served garlic ice cream and he said it was good! Beautiful picture. Looks as if it should be on a poster. Just discovered your blog tonight and I'm so excited! Can't wait to try many of your recipes. They look so goooooooood!